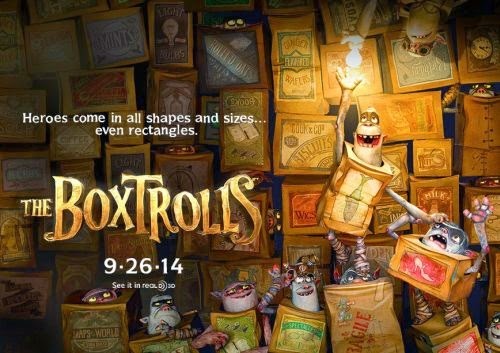 Screening Notes: The Boxtrolls: Beautiful Box, But What's Inside? The Boxtrolls tells the story of Eggs, a boy raised from infancy by a community of trolls who live underground in boxes. Lord Portley-Rind opens Pandora's box when he hires Archibald Snatcher to rid Cheesebridge of its boxtroll infestation, and the group finds itself suddenly boxed in. Eggs must think outside the box and use his entire box of tricks, or he and his friends will go home in a box. Boxtrolls box with box-boxers who try to box the boxes in a box. The Boxtrolls, like Laika's other stop-motion features, looks absolutely incredible. Not only is the claymated world impressively detailed, it's also skillfully brought to life with vivid lighting, expressive low angles, and a flowing, kinetic camera. The first act of the story is particularly exceptional in this regard, as it introduces the characters and their situation with minimal dialogue, allowing the images to speak for themselves. The first 15 minutes or so play out almost like a silent movie, using the tools of cinema to tell a story visually. The voice acting in particular is also quite well done, from the more experienced work of Ben Kingsley and Jared Harris as the adults in need of some eye-opening, to the more youthful work of Isaac Hempstead Wright (Bran Stark, for you GOT fans) and Elle Fanning as the children looking to change the world. But for me, the exterminators voiced by Nick Frost, Richard Ayoade, and Tracy Morgan stole the show. They're the one element of the film which is clearly geared to work simultaneously (but on different levels) for both children and their parents. Nick Frost's Mr. Trout in particular takes pleasure in raising philosophical inquiries about the nature of good and evil, which for young viewers comes off as a lot of silly nonsense (which it is), while older audiences can appreciate the truth behind his musings (that "bad guys" often see themselves as doing something good; that good and evil are two sides of the same coin). In a similar vein, the film can also be read as an allegory for class conflict. There are three levels to the society of Cheesebridge: the "white hats," the aristocracy or high class; the "red hats," the manual laborers or middle class; and the boxtrolls, the unemployed or low class. These distinctions and their association with socio-economic standing are highlighted visually in the film, with the colored hats recalling the similar distinction between white- and blue-collar workers, and with the scavenging of the boxtrolls providing an optimistic mirror image for the nightly activity of the world's homeless. The narrative depicts the way middle-class ladder-climbing depends on the continued oppression of the lower class, with Snatcher's acceptance into the circle of white hats predicated on his elimination of the boxtrolls. There's also a potential psychoanalytic reading of the film available, with the semi-mute boxtrolls representing a pre-symbolic fantasy from which Eggs must escape to successfully integrate himself into the fabric of the symbolic order (where he learns his real name, finds his real parents, etc. ), but despite my efforts this reading doesn't work as well as I want it to. After the opening act, however, the film slowly loses its momentum and narrative creativity. It attempts to juggle a coming-of-age arc for its protagonist with his struggle to rescue his captured companions alongside the subplots concerning Snatcher, Portley-Rind, and the other inhabitants of Cheesebridge. The Boxtrolls runs into the problem of so many other adaptations, whereby shrinking the source material down to 90 minutes loses some of its unity and coherence. It tries to tell a story about a boy finding both himself and his community, and where the longer format of the novel can tackle both of these emotional kernels, the film jumps too erratically between them and never truly succeeds at either. The disparate elements of the film never completely harmonize, and it leaves the story feeling slightly scattered. This isn't enough to ruin the experience of the film, however, and the strong, affectionate characterization of the material makes it quite entertaining despite its lack of cohesion. Overall, The Boxtrolls is a simple but entertaining story filled with lovable characters and set in a unique and beautiful world. The creativity of its visualization is never quite matched by its storytelling, but there's enough of a plot for it to remain entertaining. Of course, I spent my time in the theater thinking up silly Marxist/Lacanian interpretations of the film, so maybe it was more interesting for me than it will be for others. Or maybe this cute story will have other audiences thinking outside the box.